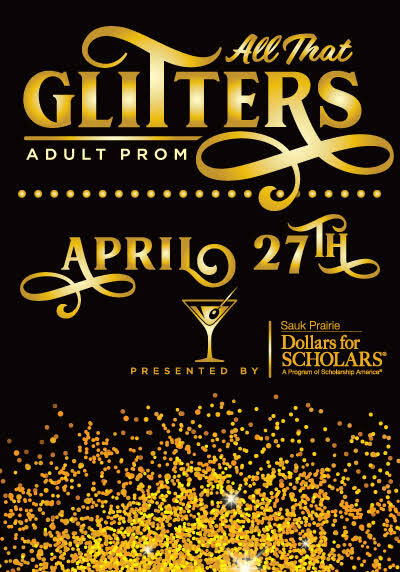 All That Glitters Adult Prom 2019 is a fundraiser hosted by Sauk Prairie Dollars for Scholars. Experience your Prom for the first time or do it all over again! Ask a date or come with friends! Get a special Prom photo to save the memories. Prom King and Queen will be determined at the event and will be decided in a whole new way! Featuring special guest musicians the Water Street Jacks, this will be a night to remember! Proceeds from this fundraiser will support the mission of Sauk Prairie Dollars for Scholars. Hot and cold hors d'oeuvres included in ticket price.